For the last twenty years, Berlin has been defined by an array of 'gaps', which created unique conditions for the experiments that inspire this blog. In-between and undefined, these gaps created perfect conditions for a locally grown city. When I first came to Berlin in 1992, I was fascinated by the split city. The government had already begun to erase the gap between the two halves. I drew a line on my first map in thick red felt marker, and began to explore the space between two states. The physical gaps were obvious, but these empty spaces were only one expression of the discontinuities and interruptions caused by the iron curtain. Berlin also straddled social, cultural, economic, and technical gaps as one world order dissolved into another. When the wall fell in 1989, these socio-economic fractures created ideal conditions for the experiments that have since defined Berlin on the world stage. This article explores the most significant gaps, and their influence on Berlin's urban development. Anyone who spent a day or two in Berlin during the nineties would have been struck by the empty spaces that defined the cityscape. The spectrum was daunting. Whole buildings that were falling apart, overgrown bomb sites, run down factories and leaking garages. Running through the middle of it all was the gap left by the wall itself. The government began to re-plan the city based on the footprint of the streets and buildings as they were a hundred years ago. After two world wars, two dictatorships and forty years of fractured isolation, the Berliners wanted to base their common future on a nostalgic image free of painful historical reminders. As a foreigner, however, I could never understand why the Berliners wanted to erase this space that defined them so uniquely in the eyes of the rest of the world. I would often observe quizzical tourists, map in hand, searching for the wall amongst the office towers that now occupy the death strip. Like a recovering trauma patient, the city only began to acknowledge their suffering fifteen years later and by this time much of the physical gap left by the wall had been developed. In April 2005 they presented a concept for preserving 800m of the former border along Bernauer Strasse, the only significant wall gap remaining in the center of town. In 1992 the government began to untangle the complicated series of unconstitutional expropriations that had begun when the Nazis assumed power, and had continued during the communist dictatorship. While ownership claims were being resolved, the East German housing agencies that managed the disputed properties were required to do minimal maintenance, and rent them out. They had no incentive or legal mandate to maximize profits, because any rent collected beyond the maintenance costs was put aside for the rightful owner. This proprietary gap gave the clerks in charge of renting out these spaces unprecedented leeway in the tenants they chose. In Mitte, Jutta Weisz was responsible for the empty shops. She actively supported cultural initiatives searching for space, and was one of the essential figures behind the activity that defined Mitte in the nineteen-nineties. When we founded Urban Issue in 1997 it was Jutta Weisz who handled our lease. 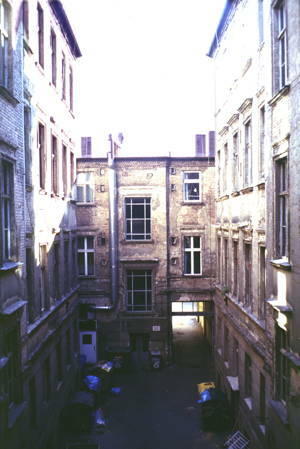 During the proprietary gap, Berlin's empty spaces were managed by people with unusual priorities. They wanted the space to be used, and were not trying to maximize the rent income. The buildings were completely run down. Sometimes even basic amenities like heating and running water did not exist, so the incredibly low rents were justified. The Stewardship laws prevented the signing of long term leases, or investing in improvements. This effectively ruled out renting to lucrative tenants. This was an unusual example of prestructures which circumvented normal free market economic logic. This situation was not planned, or even considered an urban development strategy while it was happening. These prestructures have had a major impact on Berlin, because they gave budding projects room to develop. Not just any room, but prime downtown real estate. This kind of unintended support has since become scarce in Berlin, but it released a burst of energy that still resonates throughout the city. The investment gap (1998 – 2005) straddled seven years between two building booms, and gave local projects the time and space they needed to experiment and grow. It began after the reunification boom ended, and before international interest in Berlin began to skyrocket. This seven year gap was perhaps the most fertile period for the locally grown city. From 1992 to 1997 federal tax credits and euphoric optimism fueled a short lived building boom. Architects from around the world congregated in Berlin to transform the money that poured in from across the nation into offices and apartments that remained empty for years. The investors, eager to save taxes, had all bought the vision of 'Weltstadt Berlin'. They assumed Berlin would rapidly expand, comparing it with established European capitals. They were shocked and often bankrupted as the city began to shrink and rents began to fall. Investment in Berlin did not resume until halfway through the next decade, when Berlin joined the list of cities in which all self respecting global nomads owned apartments. During this investment gap Berlin was ignored. For several years it was blessed with an over supply of cheap space, which became the laboratory for a generation of urban pioneers whose projects redefined Berlin. The two German states had evolved two separate societies. For forty years values, laws and conventions diverged, creating an array of societal gaps. After the reunification euphoria subsided, tension mounted. As Germans began to feel the socio-economic strain of reunification, they voiced their frustration with divisive rhetoric about Ossis (East Germans) and Wessis (West Germans). Wessis thought they bore the financial burden of rebuilding the East, while the Ossis felt like they were on the losing end of a corporate merger, as they slipped from 'full employment' to 20% unemployment. Ossis saw Wessis as profit chasers who had lost track of life, Wessis thought Ossis were lazy. These stereotypes reflected the societal gaps that permeated the social order after 1989. They were stronger on the fringes of town than in the center, where people felt less bound to the social and legal conventions lying behind the stereotypes. City officials and residents often turned a blind eye to fire code infractions, restaurant license infringements, or noise emissions violations. This gave many upstart projects the leeway they needed to establish themselves. Unlicensed clubs and bars could start operating in basements without adequate fire exits or sanitary facilities; now, these operate in fully renovated industrial sites that conform to code. A parade that started as a birthday party on the street evolved into an event for a million and a half participants. People occupied houses that eventually became established cultural centers; flea markets sprang up in the empty spaces and are now listed in every tourist guide book. Berlin's societal gap allowed start ups to focus on the mission critical aspects of their project, and they did not have to divert their meager resources into diligent legal conformity. The East-German infrastructure was in terrible shape when the wall came down. Everything was falling apart. One example of this was the telephone system. In the early nineties there were almost no telephones in Mitte, and the telephone exchange was so out of date that it had to be completely rebuilt. It was 1996 before people living in Mitte could get a telephone line installed. To bridge this communication gap, people met face to face. This severe restriction is unfathomable in an age of instant global connectivity, but it focused people on their immediate surroundings. To talk to someone, you had to visit them. If they weren't in, you left a note. In lieu of an iPhone, people had a note pad attached to their apartment door. The buildings weren't locked, you could just walk in. For a few years this primitive communication form added an unique flair to life in Berlin, underscoring the experimental atmosphere of a town open to new ideas. It helped foster a tightly knit community, and strengthened people's relationship to their local work and dwelling places. Berlin's gaps are gone now, the empty center has been filled. People who seek Berlin's legendary experimental atmosphere are drifting towards the city's periphery. The gap shortage has begun, and with it a new phase of Berlin's evolution.